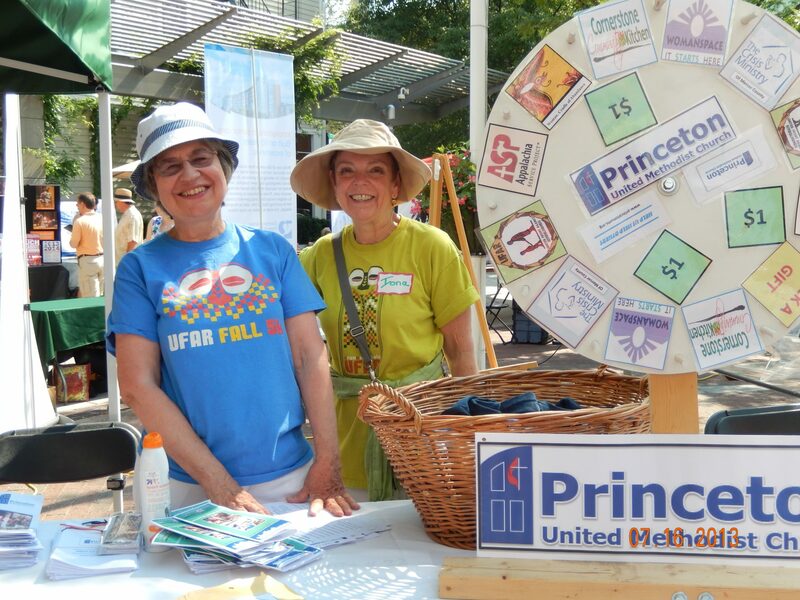 Though it was 100 degrees in the shade, PUMC’s Growth Committee took its message “Help Us to Help Others” to the Princeton Regional Chamber’s “Plaza Palooza” networking event on July 16. From 4 to 7 p.m. at the Princeton Public Library’s Hinds Plaza, folks “spun the wheel” at the PUMC table. This was the third year that PUMC’s wooden wheel, crafted by Tim Ewer, had a workout at the chamber’s mid-summer marketing expo. Local businesses (hotels, restaurants, contractors, laywers) gave out all kinds of free stuff, plus a limited number of nonprofit members of the chamber (such as Morven, State Theatre, and Habitat for Humanity) were represented. Iona Harding prepared the wheel this year to include six charities that the church supports: Womanspace, Crisis Ministry, Appalachia Service Project, Cornerstone Community Kitchen, and United Front Against Riverblindness, with its sister organization, Women of Abundance. Also staffing the table were Elsie McKee (from Women of Abundance and UFAR), Lindsey Donaldson, and yours truly. The wheel makes satisfying clicks, and we took the role of carnival shills. “Step right up and spin the wheel,” we called, “wherever it stops, there’s where your money goes.” We told the spinners about the charity they “won” and they were invited to contribute $1 to it. If it stopped on “Free Gift” they chose from the basket of UFAR T-shirts, cute fabric purses made by FEBA, UFAR bookmarks made by Susan Lidstone, or a bar of chocolate. Everybody went away with a brochure about the charity they “won.” Kids got to spin for free and choose one of the beautiful bookmarks. We met lots of folks we knew, made many new friends — and were heartened that lots of them already knew about UFAR and Cornerstone Community Kitchen. The word is getting out there! PS: The Growth Committee can use volunteers — as Greeters and as Poster Put-er-upers — and more!. Talk to Iona. This entry was posted in ASP, Community, Cornerstone Community Kitchen, General, Missions, UFAR. Bookmark the permalink.